Do you still search for files in your computer using only file names? The end result is always the same – a bunch of files with similar or the same name, and you have to open each one to find the right one. Step up your game with today’s discount software promotion, DeskRule! DeskRule lets you search and filter files using over 300 file properties, making finding the right item exceptionally easy. With DeskRule, you’ll be able to leverage the flexibility of file attributes to quickly find files by Artist, Author, Tags, Keywords, GPS location, and more! 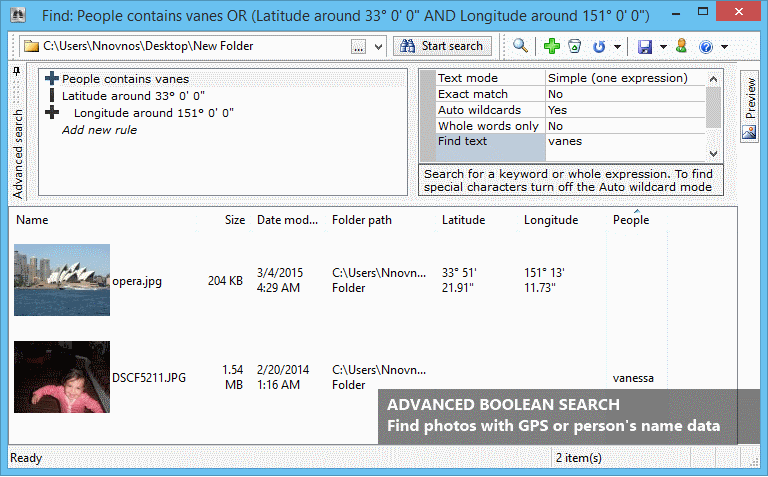 Search using DeskRule isn’t limited to just your computer. In fact, you can use DeskRule to search mobile phones, cameras, ZIP archives, and virtual folders. You can even use wildcards and regular expressions, combined with Boolean search, to perform amazingly complex searches that deliver results! Until recently, using DeskRule, you could only find files in the conventional way, say find documents modified in the last month or pictures with 4 stars rating and above. But what if you wanted to check file properties against each other? E.g. find files whose Modification date is older than their Creation date? Now you can do just that with the unique desktop detective search mode. 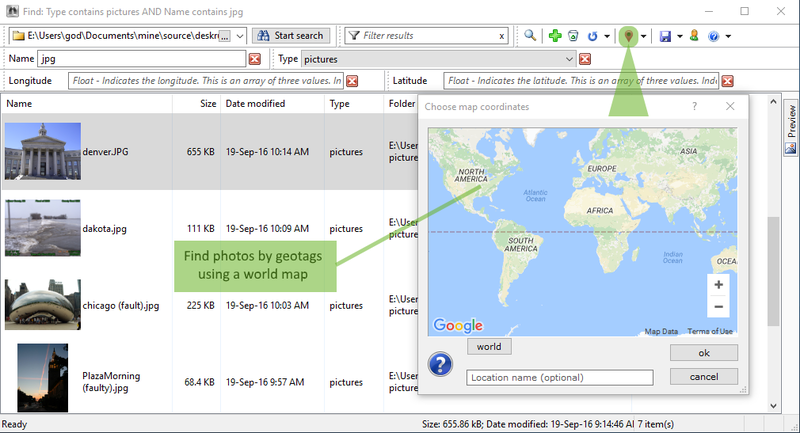 $System.Size + 5KB < $Stock.TotalFileSize"
Please note folks: you can now search your photos using a map, please click here to read more about this. Trying to decide which version of DeskRule (Lite, Standard) is right for you? Check out the feature comparison matrix and make an informed decision! After you purchase DeskRule it may be used indefinitely. DeskRule is licensed per user, so if more people are going to use DeskRule you will need to purchase additional copies. Each license allows installation on all owned computers, and DeskRule may be used at exactly the same time on each of them. Mark Harper Does this offer include lifetime upgrades to all future versions? If not how much will the cost for a version upgrade be? How much would it be to pay for lifetime upgrades as I have these with Xplorer2 Ultimate? As a license holder for Xplorer2 does DeskRule give anything more than the search facility in Xplorer2 Ultimate? The fine print states that license activation is not required but I'm sure that it is so I wondered if all the other details in the fine print were complete. JOI Tried to purchase with 50% off deal, but when directed to the site https://sites.fastspring....er/confirm no coupon code and shows up as regular price? Mark Harper Thank for the info Nikos. Just tried to purchase using Firefox and it shows full price. However, Chrome works so anyone with the same issue be aware of this. Marc User I have Xplorer2 Ultimate and find it to be an excellent and useful program. DeskRule also sounds very useful but I'd much prefer if it had an option to index the main drive. I don't use windows search and my current search program manually indexes the main drive every night through a batch file. Mark Harper @Marc User I've just bought this software and from what I've read so far you can add frequently searched locations to the Windows search index and DeskRule will use the Windows index. nikos bozinis @Marc User windows index isn't the resource hog it used to be. I am sure you will find it more gentle than your present solution if you turn it on, then you can add as many drives as you like. You will find the search speed increase hard to believe! HJ B If I right click on a folder, the context menu gives me the ability to limit my search to that folder. 1. If I right click on the desktop, no DeskRule option is presented. 2. If I click on MyPC, the context menu only searches the C drive. Is there a way to search across all drives that are on line? I know that if I click on a particular drive, it will search that drive. nikos bozinis if you right click on "myPC" (or thisPC) deskrule will search all the LOCAL drives, including those attached USB and mapped network. What kind of drive do you want to search that doesn't fall under myPC? also note you can add multiple top folders separating them with | e.g. Marc User @Mark @nikos - I prefer to not add un-necessary background tasks to my old 32-bit Win7 computer. My current solution is very gentle as it's only active at night when I'm not using the computer and it does a complete re-index of any active drives. It too can index and store offline drives. The only reason I'm looking at other options is that the search function is a little clunky. Does DeskRule create it's own index for the offline catalog or does it use Windows search to create this too? Marc User @nikos Is it possible to trigger a reindex by command line. I don't really need the current days files in the index. Amit Trying to buy std in chrome, but its showing full price only of $39. How to get the discount ? Bertie Brummel @ Amit: I bought a standard version yesterday using the Opera browser w/o any problems. Shows the correct price today too. Maybe it helps to clear your browser's cache? Gary User How do I register the program? When I start the program there is no opening screen and no button for “I have an unlock key” – It just opens to the search page. Clicking Help then About just tells me it is unregistered with a link to purchase or upgrade. Gary User After performing a search for text, at the bottom, it asks "didn't find what you were looking for, try robust search" or something similar. Clicking robust search cause the program to close. Gary User Does DeskRule search outlook emails? I'm impressed with the interface as opposed to X1 Search, but I need a search program that searches both office files (excel, word, and outlook) as well as pdf's. I've been using X1 Search for several years and it does a great job of finding text in files in outlook as well as pdf's and word and excel. If Deskrule doesn't search email files, then the interface isn't going to be enough to get me to switch. "To use it, first copy out the key text above (e.g. using ), then start DeskRule and in the opening screen click on the button I HAVE AN UNLOCK KEY, then follow the instructions. If you can't see this opening screen, please wait one day, DeskRule won't nag you on the very first day!" Gary User I have my default browser set to chrome. Why does clicking on the help link in the program use Microsoft Internet Explorer? Cutting and pasting the help URL into microsoft file explorer starts Chrome (because it is the default browser). For security reasons, I prefer to NEVER open IE. I have three internal drives and one external. When I do a search of This PC, the results only show finds on Drive C.
If I run the same search using Everything, the results show finds on all connected drives. @HJB, deskrule searches in 2 phases, first using the index and then using a slower mode of its own. If your external drives are not in the windows search index, they won't be found in pass #1. You can click on the CLICK FOR ROBUST SEARCH button to initiate phase #2 (slow) search. Gary User when I click on "CLICK FOR ROBUST SEARCH" the program shuts down. Sometimes it restarts itself with an empty search pane. But it has yet to do a robust search. Gary User A regular search does find pdf files, but they do not show in the preview panel. Is there a setting I need to turn on to preview pdf files in the preview pane? Richard Blake The offline catalog intrigues me. Once I have loaded it with directory/attribute data from all my external hard drives, flash drives, etc, can DeskRule analyze it and report all duplicate files (same size and MD5 or other hash value, if those are collected) across volumes, or all files with duplicate name (possibly different revisions of same file)? (In such cases I would not search for a particular name - I am interested only in locating potential duplicates.) Can it find groups of sound files of equal or close duration (e.g. 10s or 2%, as I may specify), regardless of type (mp3, ogg, wav, etc). Can DR present a directory listing of an offline volume, i.e. list all files in the volume, in various sequences (alpha within directory; alpha; rev date; size)? Does the catalog record total space consumed and free space in each volume? That would be of value if I wish to reorganize data, e.g. move contents of some smaller volumes to a larger one. Thanks. Joe McCormick Gary. I was having trouble viewing PDF files. When I selected Documents for Type in the settings, I was able to view most but not all of my PDF files. Maybe Nikos will have a better answer. 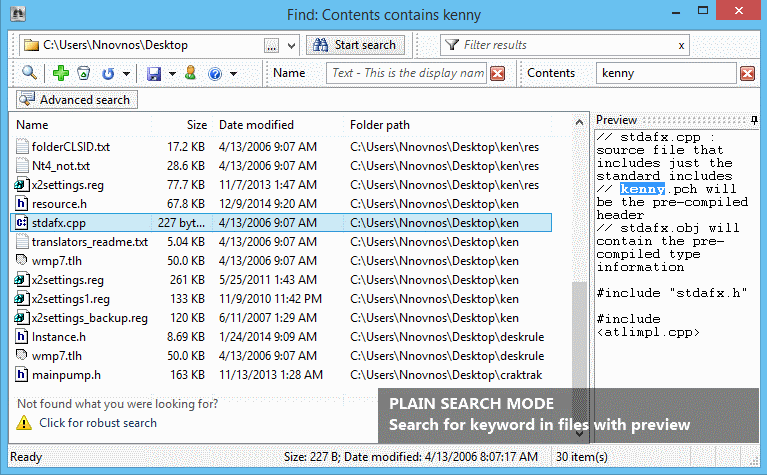 Amit Is deskrule std same as the search in Xplorer2 Ultimate? What are the diff.s besides cataloging ? Also does buying the std here ensures lifetime upgrades if we buy at current date in bitsdujour, as above stated, or will we stop getting updates anytime in future, if we buy from this deal today? Please clarify. @Joe McCormick see above my reply to gary; which program do you have installed for PDF? Joe McCormick nikos. I have Adobe Reader, PDF-Exchange, Power PDF 2, File Center Pro 10 and Wonder Share PDF Element 6 Pro. Gary User OK - I'll email you about the robust search issue, but as for a PDF viewer, I use the full acrobat DC desktop program. X1 Search has no problem displaying pdf's in its view pane. Chrome has no problem displaying pdf's. So I suspect the problem is with DeskRule. Is it possible that Adobe has some sort of licensing requirement you would have had to purchase to use Acrobat as a pane viewer? If so, why not just be honest with consumers? Joe McCormick nikos. Do you know if you will be offering your xplorer2 v4 professional and ultimate here at Bits?